Whether they were caught red-handed or you only know they’re there because of the damage caused to your plants, we have an entomological crime on our hands. We’ve rounded up the usual garden-gutters, but can you solve the case as to which one’s responsible for your flower bed’s failure? Topping the list as one of the worst of the worst, are the pear-shaped, slow-moving suckers known as “aphids.” Guilty of feasting on garden plants, fruits and vegetables; these light-green pests cause foliage to distort and leaves to drop. If that weren’t enough, they make their mark by leaving behind a sticky honeydew substance which supports mold growth and the spreading of viral diseases. Whether you know them as cabbage loopers, cabbage maggots or simply their alias of “caterpillars;” you’ve likely seen the effects of this bad-to-the-bone bug if you’ve ever attempted to grow a vegetable garden. While cabbage loopers admittedly stick to a strict diet of cabbage-family sprouts, these fugitives mean business once they begin feeding. They tunnel straight into roots, killing the plant directly, or creating entryways for disease organisms to hold your veggies hostage. When it comes to slugs, you’ll often see their evidence before you actually see them. Leaving behind clues such as leaf holes and slimy trails, these smooth (and slimy) criminals have made a reputation for traveling in packs, devouring fresh flower buds, mowing down seedlings and even worse– spreading disease. Although it may take a magnifying glass to notice these pint-sized pests, the destruction they cause to your plants are an easy spot! Causing a dusty appearance with yellow mottling on leaves, red spider mites thrive in the heat that Central Arkansas summers are known for, and deem dehydrated plants as their easiest prey. If we had to guess, every member of the jury has likely had a run-in with the always-elusive Japanese Beetle. Metallic green with bronze wing covers, these non-discriminating diners will happily feast upon nearly any petal– from butterfly bushes to even the, notoriously pest-proof, purple coneflower. Japanese Beetles skeletonize leaves, munch on flowers and strip plants clean. They even bring their partners in crime, their larvae, to feed upon the roots of your lawn and garden at the crime scene. 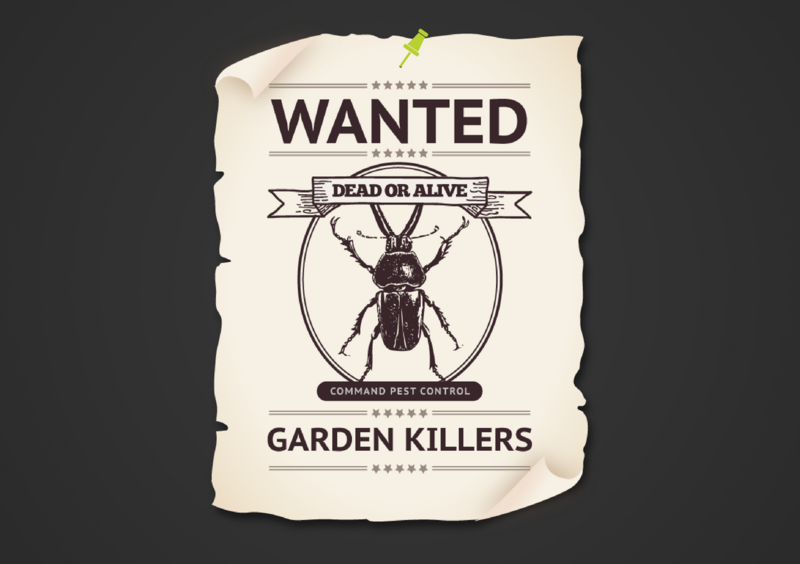 Whether it’s one of these garden pests invading your yard, or another one of their accomplices, the verdict is simple– it’s time for them to start packing. Contact Command Pest Control today for your free estimate, and we’ll make sure these pests are prosecuted.